A landmark agreement supported by states, tribes and federal agencies is expected to change how water is spilled at Columbia and Lower Snake River dams to boost the survival of young salmon while limiting the financial hit to hydropower. After decades of arguments and court challenges, a landmark agreement supported by states, tribes and federal agencies is expected to change how water is spilled at Columbia and Lower Snake River dams to boost the survival of young salmon while limiting the financial hit to hydropower. The agreement is to be recorded Tuesday in U.S. District Court in Portland and is intended to be in effect for the 2019 salmon migration season, and remain in place through 2021. The pact addresses how water passes over the hydroelectric dams during the crucial spring period when young salmon migrate downstream to the ocean. Spill would be cranked up, according to the agreement signed Friday, during the times of day when power is not in highest demand, and generating it is not as profitable. During the most profitable hours, typically during the mornings and evenings, spill would be reduced. The idea is to help salmon with higher spill, while keeping lost-power generation costs at, or potentially even below, current levels. The agreement tracks with one of the recommendations from Gov. Jay Inslee’s orca task force to boost spill as a near-term way to increase survival of chinook salmon, the preferred food of critically endangered southern-resident orca whales. For the Bonneville Power Administration (BPA), which markets public power from Columbia River Basin dams, the agreement will give the administration more opportunity to sell electricity when prices are high. Greater revenues will help BPA pay for what is believed to be the most expensive fish and wildlife program in the world in the Columbia River Basin. BPA Administrator Elliot Mainzer described the agreement as an opportunity for an important change in direction on what has been a divisive issue. He said people “who historically have been on opposite sides of the table” found common ground on how to improve salmon survival and help the BPA take advantage of new opportunities in a changing energy market that will improve the economic viability of the hydropower system. Mainzer said he had briefed Inslee and Oregon Gov. Kate Brown and hopes the agreement will limit the power-sales losses caused by spill to the 2018 calculation of nearly $240 million annually. The costs could be below that amount as BPA will be better able to take advantage of daily electricity- market fluctuations. The agreement also depends on Washington and Oregon changing their water-quality standards to allow greater amounts of dissolved gas in the river, caused by the plunge of water over the dams. Washington and Oregon are signatories to the agreement. The orcas depend on a wide variety of chinook runs. Spring chinook from the Columbia and Snake rivers are important to the whales in the early spring. In summer, they follow chinook from the Fraser River in British Columbia as well as Puget Sound rivers. In fall and winter they pursue Puget Sound chum and coho as well as other fish, in addition to salmon all the way along the U.S. West Coast. Spilling water to help salmon move past the Columbia River Basin dams began back in the late 1970s and has resulted in a long battle over management of the Columbia River hydropower system. 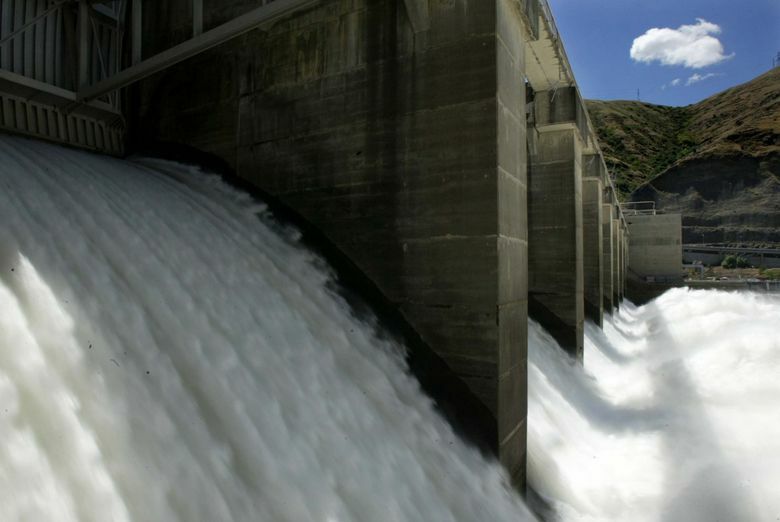 Salmon advocates have pressed in court for more water to be spilled over the dams rather than run through power turbines. 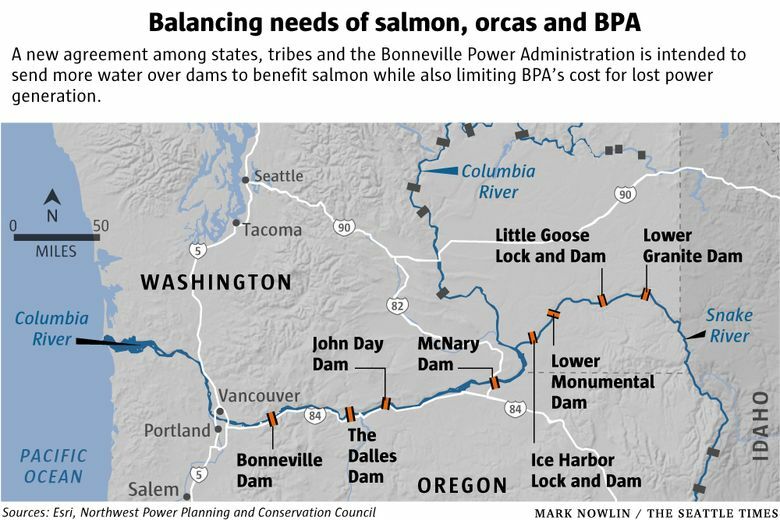 Spill, and other shifts in dam operations to aid salmon, has been a significant cost for BPA and the region’s ratepayers. Since 1981, BPA reports more than $7.7 billion in lost power-generation revenue and power purchases because of changes in dam operations to benefit fish. This sum represents close to half of the $16.4 billion that has been spent on BPA-financed fish and wildlife programs in the Columbia River Basin through the decades, according to statistics provided by BPA to the Northwest Power and Conservation Council. The spill has come under attack by some in Congress, including two Washington House Republicans whose districts are east of the Cascades and who have been staunch supporters of the hydropower system. In a joint statement released Monday, Reps. Dan Newhouse and Cathy McMorris Rodgers challenged the benefits of spill and warned of harm to salmon. “The purpose of this agreement was to end litigation, but there is no indication that it will even do that … This costly plan is worse than useless,” the statement said, in part. McMorris Rodgers sponsored legislation that passed the House this year — but not the Senate — that would have barred an agreement such as this one without approval by Congress. The bill also would have rolled back court-ordered additional spill that took effect in 2018, and is projected to cost ratepayers $38 million annually. The cost of salmon restoration has been a big issue for regional utilities that buy the Columbia Basin power, and are concerned about rate increases. Utility officials have been aware of the negotiations over the flexible spill, but haven’t had a chance to offer direct comment, according to Scott Corwin, executive director of the Public Power Council, which represents about 100 public utility districts, cooperative and municipal utilities. Michele Dehart of the Fish Passage Center said monitoring over the next three years will be crucial to see if the benefits are as expected. “We have more than 20 years of studies that shows spill passage is the best thing for out-migrating fish and returning adults,” Dehart said. Passage through the dams is just one aspect of salmon survival. But making the trip through the dams as benign as possible helps counteract other factors, such as poor ocean conditions, said Guy Norman, a member of the Northwest Power and Planning Conservation Council representing Washington state. The hope, Norman said, is that the program can get Snake River chinook on a path toward recovery. NOAA recovery plans show wild Snake River spring chinook are headed toward extinction, even as BPA has been facing higher and higher fish costs and volatile power markets. Joseph Bogaard of the nonprofit Save Our Wild Salmon cautioned that the measures won’t be enough for the species’ recovery, and said his organization and others will continue to push for removal of dams on the Lower Snake River. Dam removal is going to be under review by a new governor’s task force in the coming year, and is under examination in the ongoing federal court proceeding in Portland. Shannon F. Wheeler, chairman of the Nez Perce Tribal Executive Committee, a signatory to the agreement, said in a statement the tribe has actively participated in the Columbia and Snake River litigation but will set it aside until completion of an analysis of the dam operations required by the National Environmental Policy Act. “The Tribe has long supported breaching the four Lower Snake River Dams,” the statement said.